Lyle: Here is a slow blues groove in Em that sounds like Zeppelin meets Pink Floyd. This groove is in 6/8 time signature, 6 beats per measure. Listen to the ride cymbal of the drums and count along, 1 - 2 - 3 - 4 - 5 - 6. 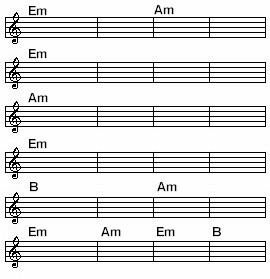 Lyle: You want to strike the chord sharply, once for each measure on beat 4, as you count to 6, then you quickly choke or mute the chord right after you hit it. Playing a slow rhythm riff like this is challenging. Lyle: If you were to improvise against this jam in Em, I suggest using the E natural minor scale. This scale has a real smooth sound to it and easy to come up with simple melodies with when improvising. Lyle: Bar 10 is a rake or a sweep as you hold down that little Em chord. Lyle: In measure 14, during the B chord, I use a different type of minor scale - the E harmonic minor. Whenever you are in a minor blues jam and the "5" chord is a major or dominant, the harmonic minor works great for just that chord, then switch back to the natural minor when the chord changes. Lyle: Enjoy this slow jam in the darkest of all keys, the E minor key. weasel: Thanks Lyle, you make me a better guitar player. dan: My wife thanks you for making me a better player lol! Lyle: Tell your wife I said she's welcome! See you all at the next jam!